The key with consolidation, particularly with 911, is how do you do it without dismantling what you’re already doing because you’re serving the public? When you’re closing centers, there’s a lot of detail. It takes six to nine months to close a center and bring it into a consolidated system. You’re bringing over and standardizing coding procedures, consolidating technology, educating personnel, and working with multiple police and fire agencies to make a smooth transition. The consolidation in DuPage County started with integrating a county-wide radio system. We chose to consolidate twelve disparate county and municipal radio systems and become part of the Illinois statewide STARCOM21 network. As part of moving to the statewide system we invested in 3500 new APX radios for firefighters, Emergency Medical Personnel (EMS) and police officers so we could have the ability to interoperate using the latest radio technology. Once the radio system was in place, we began work on consolidating Public Safety Answering Points (PSAPS). We took 22 different centers and consolidated them down to three. It made it a lot easier to bring agencies into a consolidated dispatch center because we already had a unified radio system. Many of the dispatch centers were using the same CAD systems, simplifying the learning curve for employees. With a consolidated center, you have all of the resources in one place, which means more efficiency in public safety response. Instead of having one center with two people answering a thousand calls, you have multiuse centers with multiple people ready to respond. In a room of 16, if you start doing emergency medical dispatch because somebody is choking or can’t breathe or delivering a baby, you’ve got a lot of people who can pick up the next call. The goal of DuPage County is to serve the community and be diligent about how we spend taxpayer money. I think our consolidation project says, A-Plus. We’ve reduced cost, combined services and become more efficient. Our center consolidation effort has netted the county a seven million dollar a year savings in personnel costs. Plus, we estimate we’ve saved about four million dollars in the replacement of capital 9-1-1 system equipment. It’s also about sharing information and safety, but ultimately it’s about helping citizens. I think the officers and the fire fighters realize that the consolidated communication hub (9-1-1 center) is where the information is going to be, that’s their supports, that’s their lifeline. It’s also the key to managing major incident such as a bank robbery with hostages or a major crash or even a special event such as women’s senior tour golf tournament here in Wheaton, Illinois. One of our key learnings from our consolidation efforts is the more call takers and dispatchers know in the communication center, the gold line, the better they are able to serve the police, the blue line, or the fire, the red line. To understand the benefits of consolidation, I invite you to watch the following videos where you will hear from the PSAP, police and fire agencies in DuPage County. County and municipal public safety agencies in DuPage County, Illinois consolidated multiple communication systems and command centers and now operate on the Motorola Solution STARCOM 21 statewide radio system with three dispatch centers. To learn more about the successful county-wide communication consolidation and preventative maintenance program, visit the DuPage County Case Study page on motorolasolutions.com. 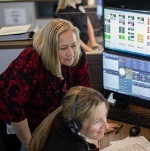 Linda Zerwin is the Executive Director of the Emergency Telephone System Board for DuPage County since 2009. Previous her role with the ETSB, Linda was in law enforcement with the Roselle Police Department in Illinois for 24 years.